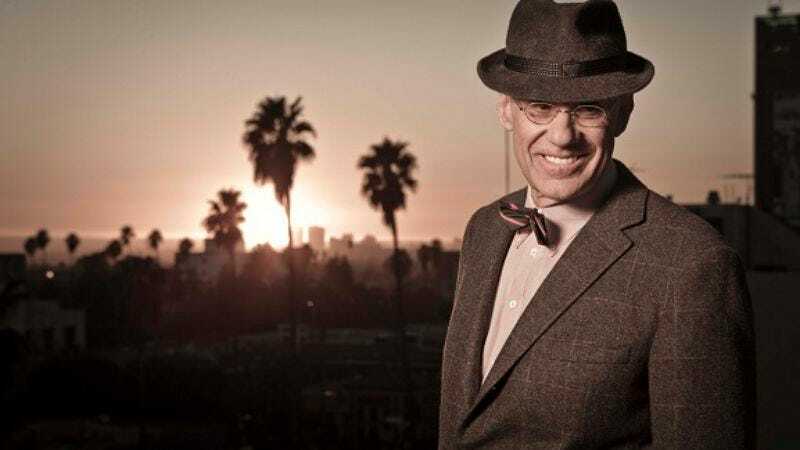 James Ellroy's L.A.: City Of Demons debuts tonight on Investigation Discovery at 10 p.m. Eastern. Though unexpected, it’s not the worst idea to drop James Ellroy—author of L.A. Confidential, American Tabloid, and other extraordinary books that make the thin line between the criminal underbelly of American life and its more respectable side double as a metaphor for the battles raging in our own souls—into a basic cable crime documentary series. Ellroy’s books draw from a well of scandal sheets and true-crime paperbacks, institutions that find their natural extensions in the sordid, reenactment-heavy crime series that proliferate in cable television’s furthest reaches. But Ellroy’s presence does little elevate James Ellroy’s L.A.: City Of Demons above the usual, icky, E! True Hollywood Story-style fare. It’s seldom clear who City Of Demons’ intended audience is supposed to be. Though Ellroy begins by welcoming the audience with patented crime fiction jive familiar to longtime readers—“Hello, my hellcats of nihilistic noir…”—most of the first episode of this six-episode series, “Dead Women Own Me,” rehashes, and simplifies, material from a pair of memoirs concerning his mother’s murder when he was a child (My Dark Places, The Hilliker Curse) and the true-life inspiration behind Ellroy’s breakthrough book The Black Dahlia. Ellroy fans know how deeply entwined those events have become in his psyche, but newcomers are likely to wonder who this strange, nattily attired, verbally enthusiastic man drawing connections between a famous unsolved murder and a personal tragedy is. It’s a puzzling calling card. Worse, it doesn’t do justice to his own work, skipping lightly and luridly over the details of both murders—and a pair of other crimes thrown in for good measure—while rendering them as grotesque, low-budget recreations. One of Ellroy’s dominant themes, the notion that “closure is nonsense” and that the best we can hope for is an “arc of reconciliation” with the past gets reduced to a sound bite. And the less said about the choice to render the moment an adult Ellroy clutched and smelled his dead mother’s dress as in an L.A. evidence room as a bit of straight-from-the-Taiwan-news style CGI animation the better. Animation also provides City Of Demons with one of its more puzzling elements, albeit one that sets it apart from other crime shows: Barko The Corrupt Police Dog. Inspired by Ellroy’s own, late bull terrier, Barko embodies the writer’s love/hate relationship with the police. Or at least that seems to be his purpose in his fleeting appearances. Like much of City Of Demons, Barko feels like an attempt to squeeze all of Ellroy’s obsessions into a familiar format that doesn’t want to contain it. It’s not an embarrassing effort and if it draws some curious viewers into Ellroy’s “wildly warped world” it’s done a service. But as a memorial to those killed by Los Angeles sculpted by the writer haunted by their destruction, it’s pretty thin stuff.